Sometimes I joke about my low interest in sports. (Sorry, Canadians!) I’d love it if the teams were all mascots, while one sports guy runs around for laughs. I imagine mascots worry about being upstaged by fursuiters. But the furries showed they’re good sports to Louis. The Oil Kings are really excited to do this event and they’ve already said that if it goes well, they will make this an annual event with it being one of the “circled” dates on their calendar where they actually promote this in advance to their fans. Looking for your help to entertain the crowd in between periods – looking for full suiters and nothing too scary – you do not need skates. The ice will still have the snow on it so you can run around in your feet paws. 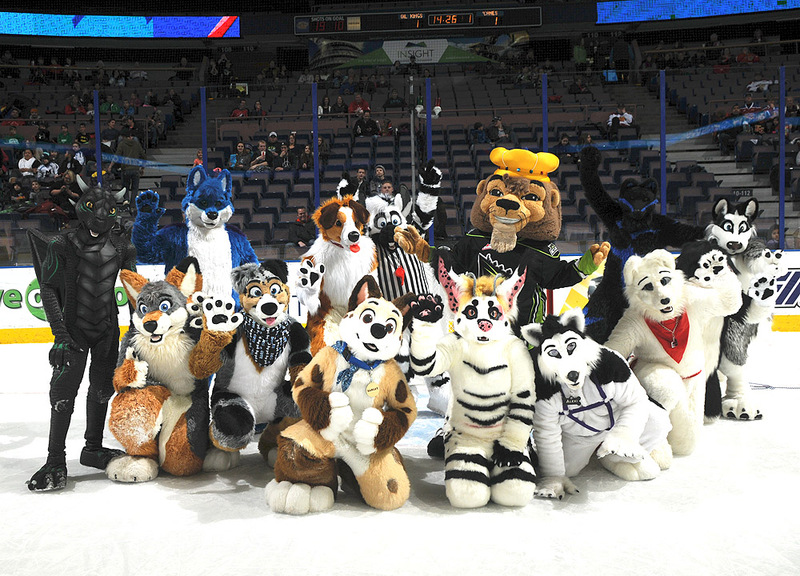 During the 1st intermission, we will have a sled race (using a giant inner tube as a sled) where Louie the Lion (the Oil Kings Mascot) will be sitting in one and an as yet unnamed fursuiter (Barley) will be in the other. All other suiters will be divided into two teams and will be pulling the inner tube with ropes attached to the inner tube. We’ll race from the red line to the opposite blue line. We want chaos, so cheating, spills & general ridiculousness is encouraged though Strypes (my referee zebra character) may throw you in the penalty box! Pretty much anything goes as long as we don’t ruin the magic (so don’t try to rip someones head or paws off, please). During the first period, Strypes (me) and Barley will be on camera in a “weigh in” event between Barley and Louie the Lion. That will be the teaser for the first intermission event that we’ll all be in. Before the first period is over, we will be marshaled to the zamboni entrance where as soon as the refs are off the ice, we’ll be going on. We will be doing a “sled race” using two giant inner tubes. Louie will be on one, Barley on the other and we’ll divide up the rest of the suiters into two teams to pull the inner tubes. Strypes will “officiate”. I’ll give everyone a run down and sort of a rehearsal for the event during the first period while we’re in our green room, but there will be organized chaos! Many delighted furries are commenting on Reddit. Yea, we had an awesome time! Thanks to BCbreakaway for organising this event. Just wish we had more ice time. It happened so fast! I think next time we should of had a better game plan on creating the chaos. But other than that, it went well! Thanks for posting this article.